"I'm listening to the new record, and it's giving me chills. It's that great!" "I'm always thinking about ways to produce sound or control sound," says Rudess, who has several new projects he'll be releasing this year. I don't like downtime," says Dream Theater keyboard master Jordan Rudess. "Music is my hobby and passion, and I love to stay busy. When I'm done with a Dream Theater album or tour, it's time to do some solo stuff. And when I'm not doing that, I have my app company. It's all good." With Dream Theater rounding the final lap on the completion of their forthcoming, self-titled new album, due out 24 September, Rudess' dance card would otherwise be open for the next couple of months. But the enterprising, entrepreneurial musician is turning his attention to expanding the reach of his award-winning app company, Wizard Music, as well as recording an adventurous new piece of music, Explorations For Keyboard And Orchestra, with the Symphonic Theater Of Dreams Orchestra in Poland. The latter project is a fan-funded undertaking made possible via PledgeMusic. 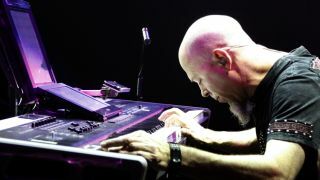 During a recent interview with MusicRadar, Rudess talked about working with the direct-to-fan organization, as well as a couple of new apps he's readying for release, a cutting-edge synth he's playing - oh, and a certain album by a certain five-piece progressive-rock band that people may have heard a thing or two about. So how does one come up with an app? What goes into it? "The way that my company works is like this: I'm not a coder, I'm not a programmer, but I am a vision-type person. I know musical instruments and technology. I know what's fun, and I think I have an idea of what people might like to experience. So I try to find people to work with me who can turn my ideas into realities, whether it's a musical instrument - something like a MorphWiz, a SampleWiz - or whether it's a different kind of experience, like my app SpaceWiz, which is what we call a 'generative' instrument in that it's almost making music by itself. "I'm always thinking about ways to produce sound or control sound, and I love trying different instruments and experiencing new apps. So for me, it all comes together in thinking up my own apps. And then once you come up with an app, it leads towards other ideas. It's kind of endless." What is the next app you have coming up? "That would be one I literally just gave to the Store to review, and it's called an EarWizard. It's an ear-training app, kind of reminiscent of that game Simon, but it's my own musical take on it. What's really cool about it is that the app features these tiny little videos of me playing chords in a particular mode, and it's your job as the user to listen to the chords, watch the little videos and then play back what you've heard. "Now, of course, in this particular context, as you get better at playing with EarWizard, the visuals that you've been relying on disappear, and then you have to remember what the chords sounded like. Just when you feel safe with that, all of the boxes on the screen switch around, so you really have to use your ear. It's part memory game/ part mental training/ part ear training - and the more you do it, the more it's about trusting your ear." How did the app evolve? Were you thinking of the game Simon, and you said, "Hey, there should be a musical version of that!"? "Yeah, pretty much. Whenever I would play anything like Simon, I would think, 'Oh, my God, this is such great musical training.' I wanted to carry that on for a while and really extend the musical domain. I have a lot of ideas about how to train people's ears; it's one of the things I really enjoy thinking about and doing whenever I can offer something. I thought that this would make a great app. There's plenty of other things to do, but this is a fantastic start." Talk to me about what you're doing with PledgeMusic. You've been involved with the company for a while, right? "Yeah, I have. Actually, just today we reached the 100 percent mark on the current campaign, so that's pretty exciting. It's been a very interesting journey. The whole idea of using PledgeMusic or Kickstarter is all new. There are people who don't understand it and some who are really into it. Whenever there's something new or different, there will be some resistance initially. In the music industry, things are constantly changing, and this is one of the big topics, these crowd-funded services. "It's going to evolve even faster soon. People want to make their music, but they don't know where to go. There's less companies to work with; the record companies are disappearing, unfortunately, and the options are limited in some ways. New paths are opening up, and I think it's important for us to explore them. "As a member of Dream Theater, I'm fortunate enough to have one of the last remaining solid record company deals, but as a solo artist, I have to investigate these new paths. The things that I want to do are unique and creative, and they're not the standard fare. Working with PledgeMusic, I'm able to get these things to happen that might not otherwise." What's the current project you're working on with them? "It's two-fold with a real focus on one of them. The biggest thing right now is this orchestral piece, Explorations For Keyboard And Orchestra. The reason why I'm doing it with Pledge is because I want to do it with a full orchestra, as the title suggests. We're going to record it, we're going to film it, we're going to do some of my other music, as well - it's pretty grand. But as you can imagine, this kind of thing costs a lot of money." What, you mean orchestras aren't cheap? [Laughs] "They're not exactly cheap. There's a lot of people involved, and it's very time-consuming. But I'm very excited - there's a plan, the funding is getting in place, and we've secured the Symphonic Theater Of Dreams Orchestra in Poland. Originally, it was going to happen in July, but now we're going to record in September and into October." What's the process in locating and selecting an orchestra? I imagine that this isn't the easiest thing in the world to do. "Good question. They contacted me a while ago. They're huge Dream Theater fans, and just this past year they put out an album of Dream Theater music done with a full orchestra. So these people were on my mind. In talking to them, I realized that they were the best choice. They're really into it, and they're going to take the time to rehearse. "The piece that I wrote is pretty hard. A lot of times, when you do something with an orchestra, they'll just rehearse it a couple of times and then do it. This piece is definitely not like that, so they'll have to pick it apart, study it and live with it. It's very involved and very exciting. I'm going to go to Poland, where I'll record my parts, mix it and master it - that's the plan. It's going to be the ultimate recording of this large piece that I wrote." And all supported by the fans. "Yeah, and that's really cool. You know, I'm very into the social media aspect of things, particularly when it comes to music. I like to share music and pictures, and the fact that I can go in and work with the orchestra, putting bits of video online and everything, that's going to be great." There's another album you're working on as well, right? "That would be Jordan Explores, which will be released in the not-too-distant future. It's going to be a piano solo album, but the way I'm going to release it is through an app, and it'll be an interactive experience. You can boot up the app and start listening to the music, and then you can use various gestures to influence and control the music. At the same time, you'll experience visuals, which can be changed and modified, as well. You can even record what you do and upload it to Facebook or Twitter, so you can share your own kind of versions of my music. It's going to be cool." You have a lot of neat "rewards" on PledgeMusic. For $10,000 you'll do a private concert. "Oh, yeah. Providing the logistics can be worked out, sure, I'll come to your place and play a concert. And then there's one where I'll play on a track of your own recording. There's a lot of great rewards. It's fun." I understand that you're using some new gear. Talk to me about the Roli Seaboard. "I'm very excited about it, and I've used it on the new Dream Theater album. It's a really awesome new keyboard that is so cutting edge and so cool that I'm actually doing some consulting work for the company that makes it. It's an elastic kind of touch experience that allows you to play notes on the keys with vibrato - unlike a real keyboard, where you hit a note and then you're basically done. On the Seaboard, you can play a note and shake your finger, and you can get a lot of reaction from it. It's like a guitarist playing vibrato on strings. It's very expressive." And then we have the JamBandit app. "This is a company that's doing some interesting things. It's an interactive experience that is really fun in a lot of ways. One of the things it does is it allows you to get a lot of the classic Jordan sounds just by downloading the app. But I decided to put out some exclusive music for JamBandit, so one can hear it on the app. "It allows you to download a song, and you can choose an instrument to play along with it. What it then does is it automatically updates the mode you're playing in. There's a magic slider that allows you to be really expressive with these cool sounds, some of which are my sounds because they're my songs. You're part of it. This is a big movement to allow the listener to become one with the music. I'm very supportive of this company and what they're doing." And on top of all of this, you're finishing the new Dream Theater album. What can you tell me about it at this point? "We're mixing it as we speak. It's all very, very exciting. One of the cool things about Dream Theater is, we don't slow down, and I don't mean just work-wise. You see some of these groups that have been around, and sometimes they drift away from their core fundamental styles. They get a little tired or their chops get tired. "With our group, that isn't the case. I don't know how everybody does it, but we all stay energized, excited, focused. We practice, and we're into it. I really see us as being more vital than ever before. I'm listening to the new record, and it's giving me chills. It's that great! And I have to say that sonically we've never sounded better." "That's right. And you can tell. He's totally dialed in. People will be smiling when they hear this. There's so much Mangini on this album. [Laughs] To me, in a lot of ways, this is his album, because he's now a total member of this group - the shining star." The record is self-titled. What went into that decision? "We really feel as though we got to this level where the music is what we truly are. Even though we've had a long career, and some of the albums are really, really good, at this place in time we felt like this record is so representative of what we want Dream Theater to be and who each of us is, both as individuals and collectively. We felt like we could honestly say, 'This is Dream Theater.' That's what it's about. We wanted to make a strong statement, and we felt proud enough and secure enough to announce to the world, if you will, 'This is what it is. This is who we are.'"